Yup. These exist and I obviously want a pair. Candy Crush Saga addiction is a serious issue. In the last week, I've spent $127.41 on special candies, extra lives, and a bunch of other things while playing Candy Crush Saga (see proof below). Assuming other people are as crazy, and likely even more addicted than I am, it's no wonder King.com's Candy Crush Saga is the top money-making game on Facebook and in Apple's app store. But the past seven days have been the best week of candy crushing yet. I quickly made it all the way from level 31 to 81, but it's still not good enough. I'm determined to catch up to and surpass my colleague Alyson Shontell, but she seems to be too much of a pro . I'm pretty sure she's past level 100 at this point. Another colleague, Kevin Smith, has told me that he has spent money on Candy Crush, but he's been vague as to the specific sum. Hmm. What's even more ridiculous about this new addiction of mine is that it just started earlier this month. 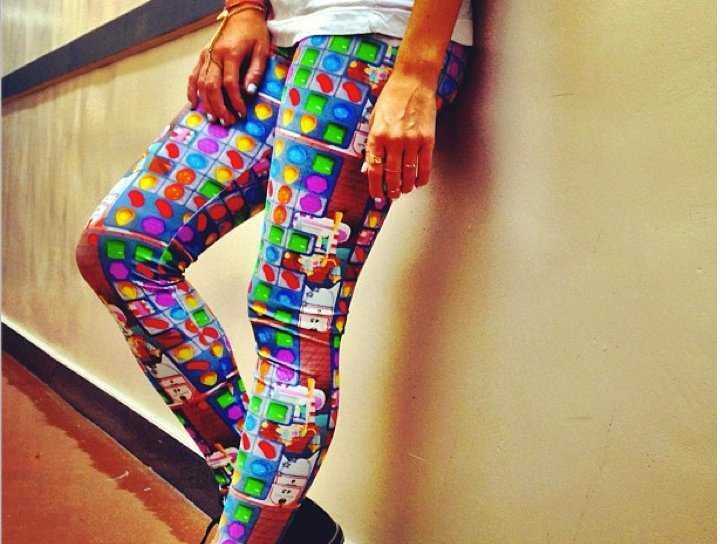 My editors had asked me to figure out why people are so addicted to Candy Crush Saga. At the time, I had absolutely no idea why, mostly because I had never even played the game. So I clearly had to download it and see for myself. On July 6, 2013, my life changed. I spent the entire Saturday crushing candies like a boss. I wasn't yet hooked, but I could understand why people were getting addicted to it. It's hard to say why I love it and why I've spent so much. But I guess it comes down to the rush you get when you match two special candies (which explode). Or when you think you're not going to complete the round, and all of sudden you get a special sprinkled candy (which can clear the entire board when deployed properly). Now, sometimes I'll buy extra moves if I know I'm really close to completing the round. They got me. I'm addicted. The game is free, but it's designed to keep you playing against your better judgment. Sometimes in order to get to the next level, you can either ask a friend on Facebook or just pay. I've become relatively impatient, so I usually just end up paying. In most levels, you only have a limited number of moves. If you run out of moves before you complete the task at hand, like reaching 15,000 points, you can buy more moves for about a dollar. When I realized yesterday how much money I spent playing Candy Crush Saga, I joked with one of my editors about expensing it. He rightfully laughed in my face. And I laughed with him. But now when I play the game, I feel a bit guilty. On the other hand, since I've made such a huge investment, I have to keep playing, right?